It was a beautiful Idaho day and we headed outside this evening to grill thick hand pressed bison burgers and then scooped this marvelous potato salad on top. We also had potato salad on the side, snuck bites of it out of the bowl, and should have stopped eating long before we did. I realize you probably already have a favorite potato salad recipe, as most families do, but this one I put all my favorite potato salad ingredients in. It’s perfectly spiced and so creamy with olive oil, mayonnaise and pickle juice. I thought I’d offer it to you just in case you had room for another one on your table. Peel, dice, and boil potatoes in unsalted water until tender, but not so soft they fall apart. When done, place in a cold water bath, until cool, then strain well. Mix all dry spices and liquid ingredients together in a small bowl. Add potatoes, onion, egg, and pickles to a large bowl, and gently stir in the seasoning mixture until well mixed. Chill at least an hour before serving. Recipe and photograph by Laura Flowers. I have a recipe I grew up with and it's the one my Husband says he married for, lol. But I like all kinds of potato salad and I am marking this one because it looks great! What a lovely bowl of potato salad! I've never heard of one with olive oil. YUM! i have linked you up to my 'fresh links' so I can see your fabulous photos every day. Hi everyone! Thanks for sharing some comment love. @Chococo- Boiling potatoes is always a sign of something good to come! I have to say this of course, living in Idaho. I don't know why, but your photos just make me happy, Laura! I love the colors in this one. Looks delicious and beautiful, too. Thanks for posting! This salad looks sooo good. We will soon be in potato salad weather again. I'm going to try your version with the celery seed and dill. That and a juicy burger are the perfect dinner. Of course I have room for your potato salad recipe! I will be trying it this summer--thank you! P.S. Kudos for the bison burger--you know how much I love it! I bet this tastes soooo good! Almost all types of potato salad is my favorite. I love the tangy and creamy taste and texture. I will have to give this recipe a try. We love potato salad in the spring/summer time. This will go perfect with one of your blueberry fruit pies! Have a great day! That does sound divine. Anything with mustard is ok in my book! I think it will be just fine with it. Maybe use a little bit less than the recipe calls for in case it overpowers the other flavors. You can always make this salad more creamy if you need to with a small amount of water if needed. Wow, great job here. Awesome picture too! 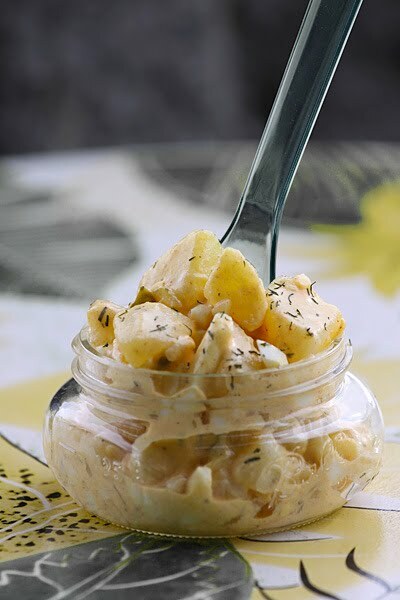 You should really consider submitting this to Recipe4Living's Perfect Potato Salad Contest! It looks delicious! Holy Moly Chunky Guacamole. It’s the Pits! Beevil the Evil Makes "S'mores"